Since early Friday morning, more than 35 million people in Brazil have been taking part in one of biggest general strikes in the country’s history against President Michel Temer’s neoliberal economic reforms, bringing the country to a standstill. 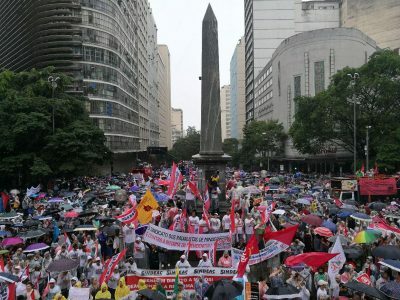 The strike was largely organized by Unified Workers Central, or CUT, the largest union federation in Latin America, and the Workers Party of Brazil, former President Dilma Rousseff’s political party. Below we bring you a sum up in pictures of the mobilizations in Brazil against President Temer (Courtesy of the New Dawn). All the Photos belong to Brasil de Fato and TeleSur, except when specified.